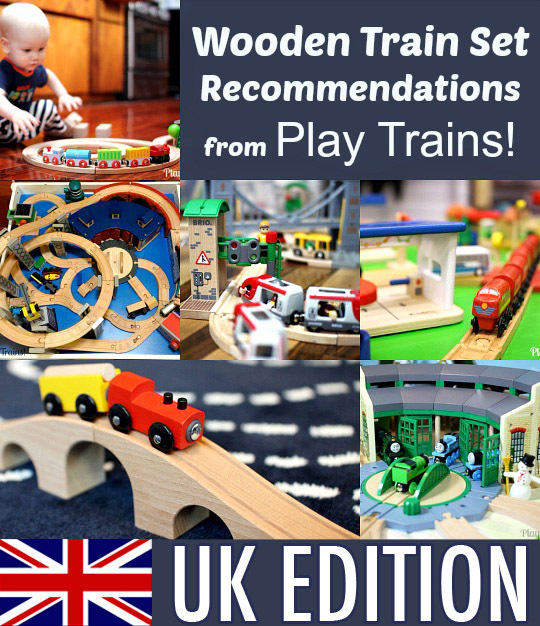 Whether you’re looking for a first train set or looking to add another major addition to an existing wooden train collection, I’ve turned my expert eye on the wooden train sets that are currently available in the UK so that you can make an informed choice. From small beginner’s sets to fun themed sets to big complete sets, I have plenty of excellent options for you to consider. 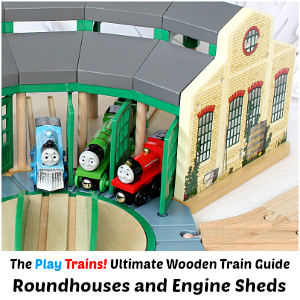 I’ve created this version of our guide to the best wooden train sets just for readers in the United Kingdom, so you’ll be able to see which sets are available in the UK and go directly to sites where you can buy them. This post contains links to Amazon.com and Amazon.co.uk. If you click on one, we will receive a small commission — at no additional cost to you — on anything you buy at Amazon for a certain length of time afterwards. Read our disclosure policy for more details. Looking for the US version of this guide? Click here! 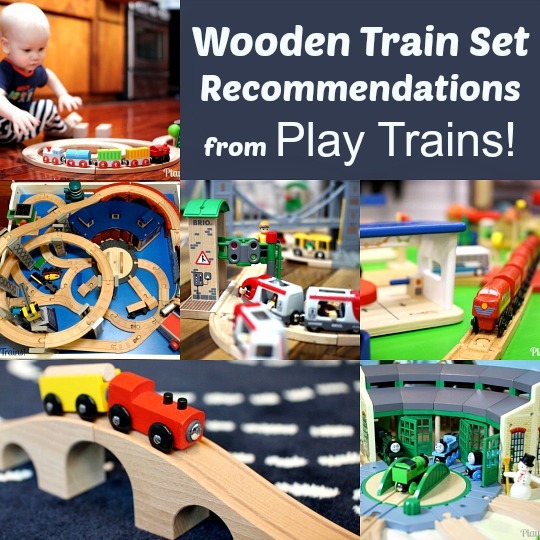 I’ve organized my recommendations by wooden train brand. 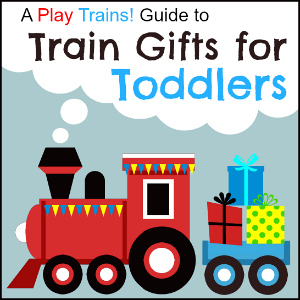 The brands are listed in my order of preference, starting with Thomas and Brio, and then moving on to some excellent brands that are more budget-friendly. I’ve added photos where I can to illustrate the general look of the different brands. However, the pictures are from various layouts I’ve built with the Little Engineer, and thus don’t represent any specific train set. If you’d like to welcome the little blue tank engine into your home, you have two choices: buy Thomas Wooden Railway sets and Thomas trains, or buy non-Thomas sets and add Thomas trains to them. Thomas brand track is by far my favorite. The quality is even better than Brio and Nuchi’s, and the railroad tie detail looks fantastic in person. While the buildings and trains are featuring more plastic than ever, I still feel — or, perhaps, hope — this is a high quality brand, and nothing can replace the way that having the trains be talking, feeling characters vastly increases the possibilities for valuable pretend play. Looking at the Thomas sets currently on the market, I would recommend this basic set. It looks okay, but the bridge is of a style that comes apart unless all the tracks in the layout are in perfect alignment. You would be better off spending a little more and getting the Steaming Around Sodor Set, which comes with a more stable type of bridge — and it’s a covered bridge, which is kind of cool — and more accessories. If you’re looking for a very basic starter set that includes Thomas, take a look at the simple but classic Thomas Wooden Railway Starter Set. And the James and the Fishery Set includes a bridge that looks like it would be high yet pretty stable, which is always a plus in my opinion. Based on this year’s Thomas DVD movie, Tale of the Brave, the Thomas’ Fossil Run Train Set is another platform set, this time with an exciting, curving slope to speed down, trying to evade a rolling boulder! There’s a little gate at the bottom of the hill that opens for Thomas to escape through, and then closes to stop the boulder before it hits him. The artwork on this set is very detailed, giving it a story book feeling, and the set will appeal to any child who is a fan of both trains and dinosaurs. 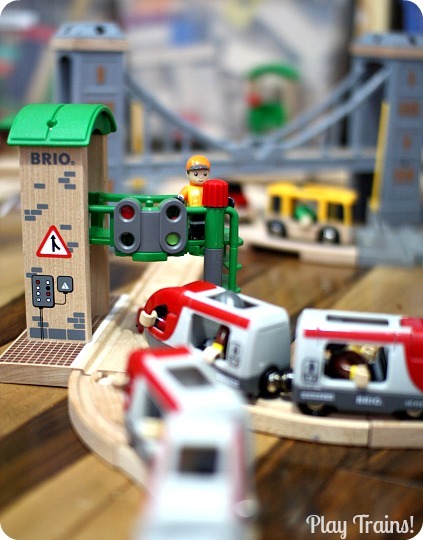 If you want to go with the highest quality, Brio is your brand. The catch is that it also can be expensive. For a long time, I thought we’d never own any Brio trains, but then we started our Brio collection when our local Toys-R-Us was clearing it out two years ago. The time we’ve spent playing with those sets has given me a great appreciation for not just the quality of the trains but also the brilliance of the train set designers at Brio. Since then, I’ve been happy to pay more for Brio quality. 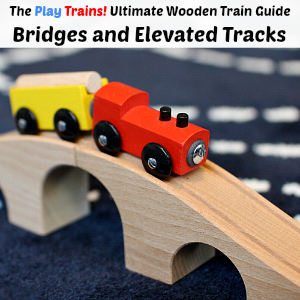 The realism of Brio trains is unmatched by any other wooden train line. And while Brio does use a lot of plastic (their trains are mostly plastic), it’s extremely high quality, heavy duty stuff, and it looks great they way they do it. 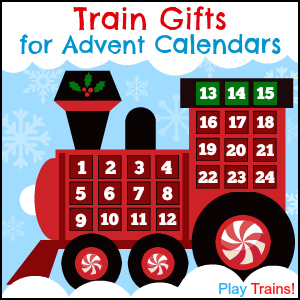 Brio’s starter set is their Little Forest Train, which features a cute little steam engine with a log car, along with an oval of wooden track and a pair of trees. 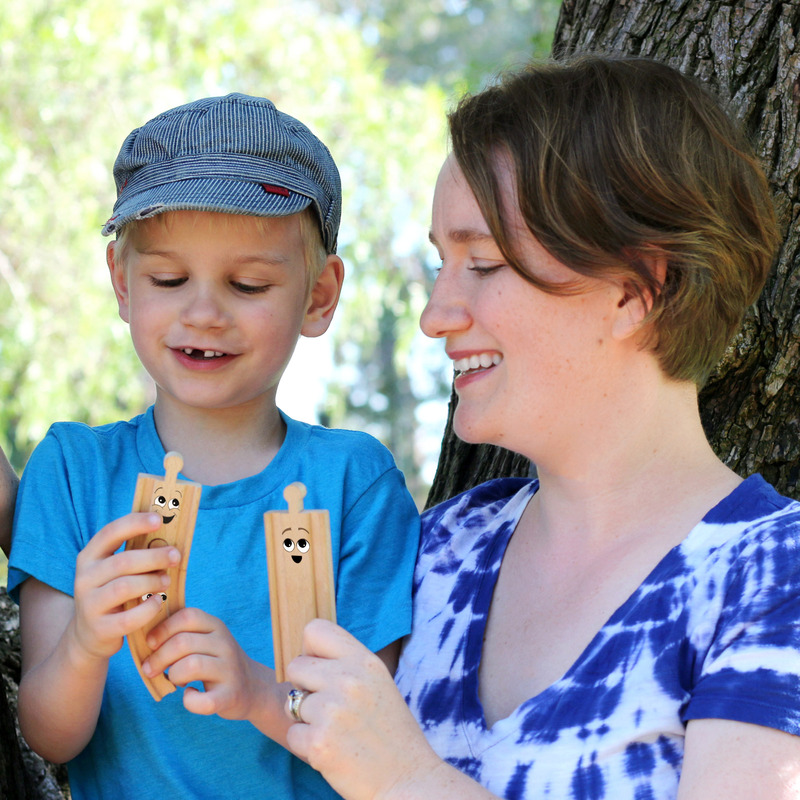 The Travel Switching Set was a very popular addition to our wooden railway. The Little Engineer loved that it came with two passenger trains, one red and one blue, with drivers dressed in colors to match their trains. The Cargo Harbor Set was a birthday gift last year, and we just love the container ship and the lifting bridge. It goes very nicely with the Brio Train Ferry, which we gave him along with this set. And searching for the UK link for the train ferry, I discovered this Travel Ferry Set with a completely different ferry! It’s a passenger ferry with a dock connected to the train tracks, so the passengers can go from train to ferry. 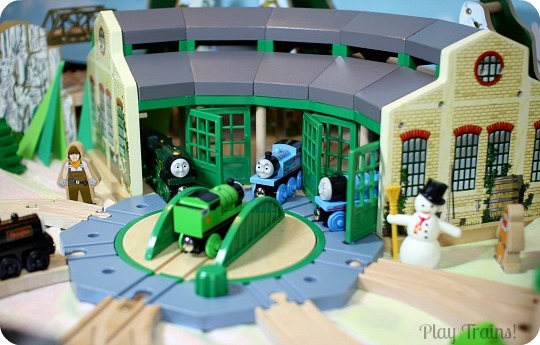 Two sets that I would love to get are the Farm Railway Set and the Metro Tunnel Set. The barn in the farm set is so cute, and we’ve had a lot of fun playing with the metro tunnels at our favorite toy store. And for the construction-inclined kid, the Rail and Road Loading Set would be a lot of fun. Now, this is one of the most expensive train sets I’m putting on this list, but if you’re looking for an all-in-one set with enough variety, durability, and playability to last a childhood (or several), the Brio Deluxe Railway Set fits that description perfectly. It would set you up with a full freight and passenger train system with lots to do. Plus, it comes with a storage box. Another excellent brand to go with is Bigjigs. Their line is just a hair below Thomas and Brio in quality and far more affordable. Additionally, they make a lot of unique and extremely clever pieces, especially when it comes to their freight cars and destinations. Bigjigs offers quite a few interesting train sets. 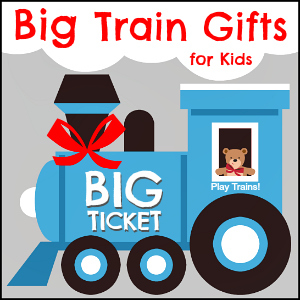 Their My First Train Set is quite possibly your least expensive option for a small, high-quality beginner’s train set. While it includes passenger coaches instead of freight cars, and so doesn’t offer the fun of loading and unloading freight, it does include two people and two houses. That could be more fun for some children than the freight. Their Figure of Eight Train Set is an expanded version of the same theme, which is then expanded further in the Town and Country Set. And then for a very large set, check out the Freight Train Set. Moving on from their basic sets, they also make sets in a number of fun themes. If your child loves construction vehicles the way they love trains, I’d suggest taking a close look at their Construction Train Set. For a car and train fan, try the beautiful Rural Rail and Road Set. Their pink and purple Magical Train Set and Table is very sweet, and it’s also available as a smaller Fairy Town figure-eight set. 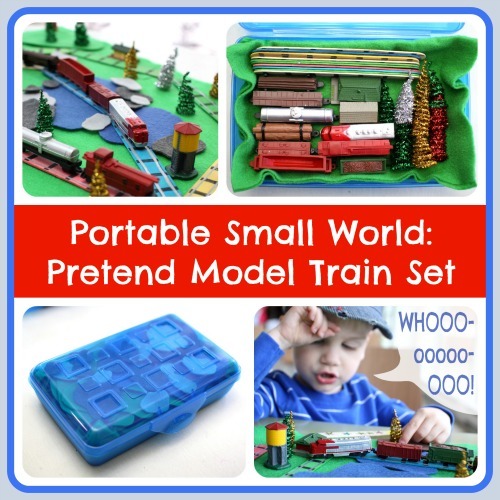 The Railway Station Carry Set allows you to pack up a small train layout inside of a very cool two-level train set. The Mountain Railway Set looks fun, and comes with a station we own and really like. However, I’m not sure how well tracks would stay put on the mountain. (I would probably just glue the curves to the mountain top on this one.) And then there’s the Around the World Train Set, which I desperately want. World landmarks have never looked more adorable! I especially love Bigjigs’ Heritage line of trains, featuring models of famous British locomotives. A number of them are so similar to Thomas & Friends characters that they could make good substitutes if you’re trying to stay away from licensed character toys. (Try Bluebell or Kent and East Sussex Bodiam for Thomas, Jack or the Metropolitan for James, Green Arrow for Henry, the Flying Scotsman for the Flying Scotsman, Kent and East Sussex G.W.R. for Duck, Duchess of Hamilton for Caitlin, the Mallard for Connor, and the Rocket Engine for Stephen…who is actually supposed to be the Rocket!) The Heritage Collection Mallard Train Set looks like a beautiful set to start or encourage an interest in railroad history. Universe of Imagination train sets — which I believe are the same as the Imaginarium train sets here in the US — are available at Toys-R-Us, in-store and online. You get a great level of quality in comparison to the low prices, which can go even lower if you shop sales and sign up for Toys-R-Us’ rewards program to get coupons. All of our Imaginarium train stuff has stood the test of almost four years of train play and still looks great. I also like that they offer a good range of fairly realistic trains. I’m particularly fond of their freight cars, which make great Troublesome Trucks with the addition of some Troublesome Truck face stickers. One of my favorite Imaginarium sets is the Timber Log Spiral Set, and the Universe of Imagination Spiral Wooden Train Track and Engine Set seems to be the equivalent set with a different theme. While not as pretty as the Thomas-brand spiral set we also own, it’s functional and fun. The spiral supports can be used with straight or curved track to make any number of different elevated configurations. 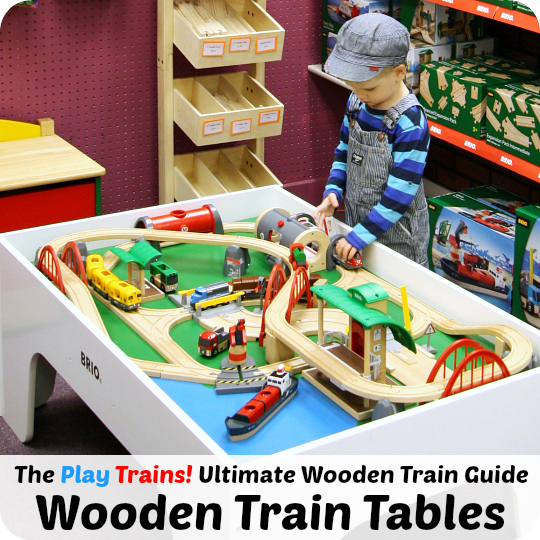 If you’re in the market for a train table as well as a train set, take a look at the current Imaginarium train table set. We have the one from a few years ago, and while the train table has gone on from taking up space at my mom’s house to a new home, the buildings, trains, and accessories from the set, especially the roundhouse, are still useful pieces in our collection. 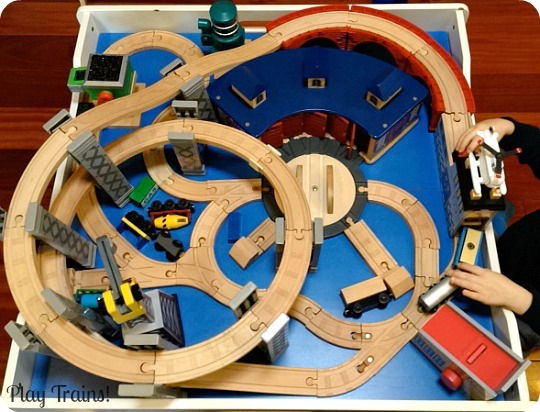 By the way, the layout in the picture above was created using elements from our Imaginarium train table set and the Timber Log Spiral set (and lots of different brands of track). Ikea is perhaps your least expensive option for a first train set, and there are things to like about Ikea trains. I was happy to see two new additions to the line this fall, a suspension bridge and a turntable, though the turntable is already sold out at our Ikea and the bridge is soon to follow. 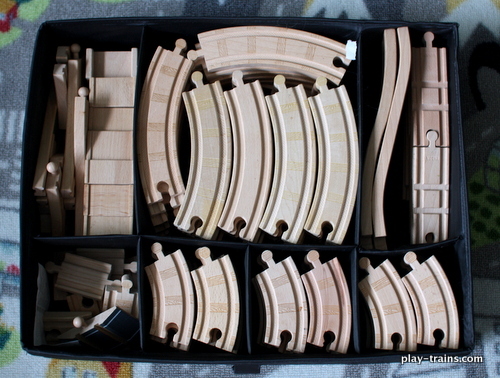 However, be aware that the plastic connectors on their track are a very tight fit and don’t work with all other wooden train brands. Also, their trains are very small, so larger trains from other brands don’t fit beneath Ikea bridges. 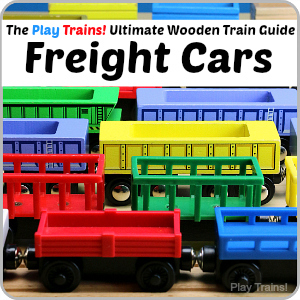 I was never a fan of Plan Toys‘ wooden trains in the past. 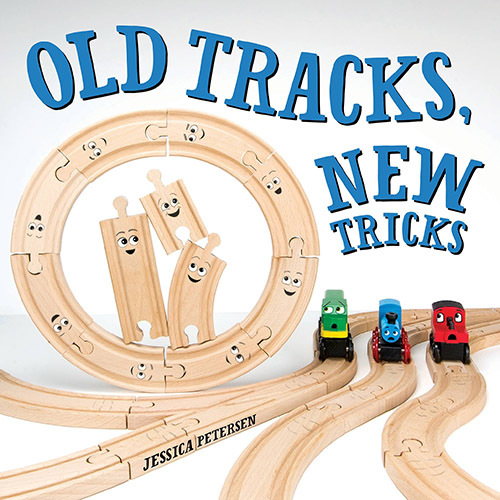 Their wooden train tracks were barely even compatible with each other sometimes, much less other train brands. However, they’ve completely changed the track now, so my hope is that they work better. Of course, now their trains have non-magnetic couplers, which means that they are not compatible with other brands of wooden trains. 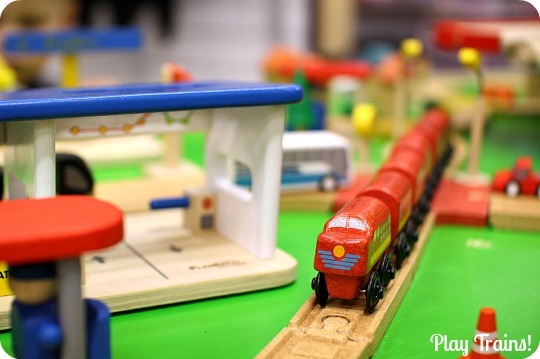 Plan Toys is the most eco-friendly option I’m aware of, so if that’s especially important to you, you might be interested in the small Plan Toys Railway Oval Set, the medium-sized Plan Toys Railway Figure 8 Set, or the large Play Toys Railway Set. 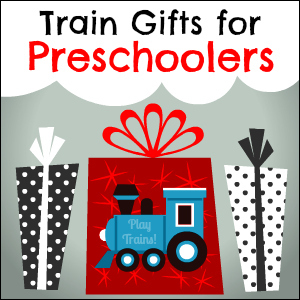 Tidlo Train Sets: I’ve only recently become aware of this brand, so I have no personal experience with their train sets. But they get good reviews, and how cool is this Tidlo City of London Train Set? I want that one for myself! 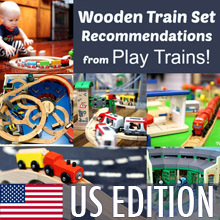 They also make a Track and Accessory Pack (which doesn’t come with a train, but does contain a full, if simple, track that connects up) and a 50-piece Wooden Train Set. Toys for Play: So, just like I think Imaginarium and Universe of Imagination are the same brand, I think Maxim (US) and Toys for Play (UK) must be the same brand. And I’m also pretty sure that Imaginarium is made by Maxim, which means that these sets are probably worth a look. 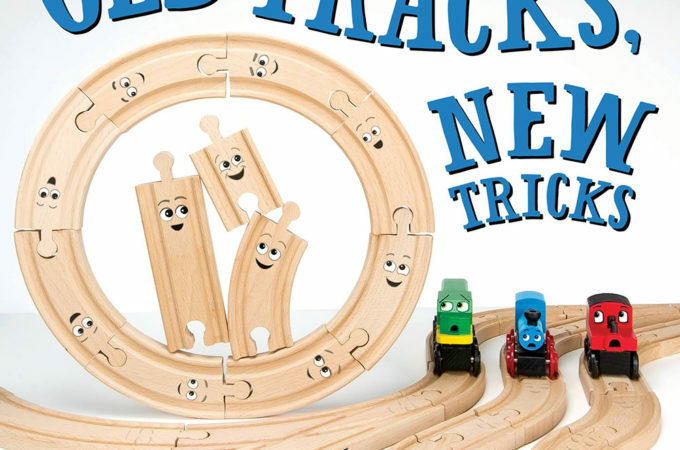 This 50-piece Wooden Train Set comes with an engine shed and a track spiral like the Imaginarium set I linked to above, except the supports for this spiral look to be wood instead of plastic. 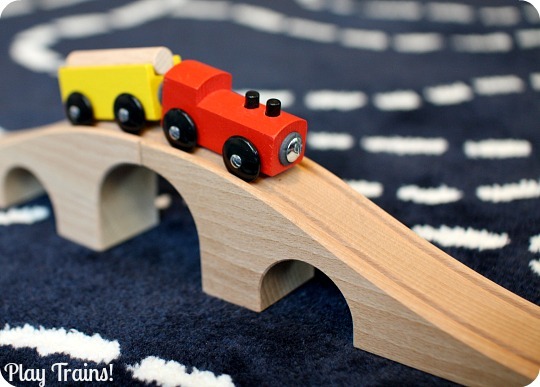 Which could be a good thing or a bad thing…good because hooray for wood in wooden train sets, and potentially bad because the plastic ones have clips that grip the tracks and I’m not sure that these do. Their 100-piece Mountain Wooden Train Set has a lot of similar elements to the set that came with our Imaginarium train table, including two of the curving, red “brick” track supports that I like quite a lot. Viga: I’m not familiar with this brand, but it looks like their train sets are potentially a good deal when you take into account the low prices. The tracks actually look like they might not be too bad at all, and people seem happy with the 49-piece Viga Wooden Train Set in the reviews. 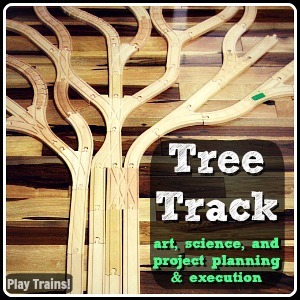 Once you have your train set picked out, you’ll want to browse our Train Play archives for lots of ideas of what to do with them! 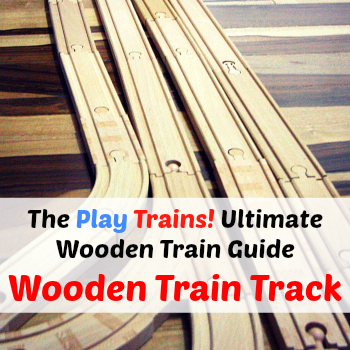 You may want to read our Guide to Wooden Train Tracks for advice on expanding upon a basic train set as well. I also recommend signing up for our email newsletter to keep up with our new train ideas and activities as we post them.